In Q1 2012, Americans spent nearly 35 hours per week watching video across screens and close to another five hours using the Internet on a computer. Amercians spend 1 hour 38 minutes per week on gaming devices and among owners of gaming devices that have the ability to stream video content (also referred to as “7th generation consoles”) the average time spent is 2 hours and 48 minutes with distinct differential viewing by demographic group. Americans also spend close to an hour and a half per week using DVD players. 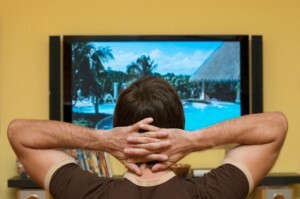 Even though the average TV viewer is watching 6 fewer minutes per day of traditional television, viewing is growing. Some viewing is shifting to other devices, including to tablets. Currently more than 15 per cent of US TV homes own one or more of this fast growing device category. Smartphones, with a penetration greater than that of DVRs, and gaming consoles are increasingly being used as vehicles for content delivery. Today, nearly 36 million mobile phone owners in the US watch video on their phones. If platform fragmentation has multiplied by type and device, video usage is also being redefined by the sheer volume of entertainment content available. The number of places people can access it and the means by which they choose to have it delivered continues to grow. Related and interestingly, traditional TV Household penetration at 95.8 per cent slowly continues to decline. Yet among those homes that are not considered traditional TV homes, 75 per cent own a TV set. Whether connected to a gaming device, over-the-top device, DVD player or the Internet directly, the television set itself continues to be a centerpiece of the viewing experience delivering the video content that the US consumer seeks day in and day out. One emerging category to watch remains the traditional gaming console manufacturers, who are claiming a stake in this evolving ecosystem. Not only have they strategically aligned themselves to provide video content and gaming interactivity through their consoles, they are capitalising on an established footprint. These evolving entertainment hubs are enabling a new set of opportunities for entertainment consumption through media applications. Though the average American consumer in TV households spends 14 minutes a day using gaming consoles, users of 7th generation consoles spend considerably more time. In fact, PS3 users are spending 36 minutes daily, Wii users 17 minutes, and Xbox360 users 32 minutes engaging with these devices. These consoles each have the unique ability to act as gaming vehicles and video content purveyors. They enable social gaming as well as DVD play and streaming through apps. They will continue to provide an increasing number of video options and have established themselves as legitimate players in the space of content delivery directly to the consumer.